The Washington Post has a story today about a “listening tour” that Ben Carson set up in Baltimore a few months ago. It seems odd that Carson felt he needed to learn more about Baltimore, considering that he worked there for more than 30 years and has lived in the area for practically his entire adult life. But he did. And he asked his son to help out by inviting some of Baltimore’s corporate movers and shakers. The high-level meetings surrounding the Baltimore event highlight the extent to which Carson has relied on close family members since joining the Cabinet. His wife, Candy Carson, son Carson Jr. and daughter-in-law Merlynn Carson have attended some of his official meetings, according to current and former HUD officials….Candy Carson, Carson Jr. and Merlynn Carson attended multiple events during the Baltimore tour, including ones open to the news media and a closed-door session on housing policy with state and city officials along with HUD employees, according to a person with knowledge of the matter who spoke on the condition of anonymity. 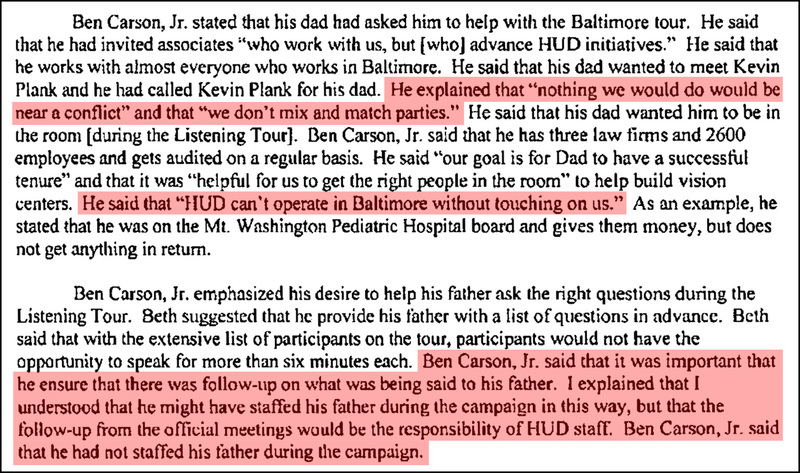 Jereon Brown, a HUD spokesman, confirmed that Carson Jr.’s role was not limited to the health-care discussion. He said no one was dropped from the list of invitees. He did not respond to questions about what steps, if any, the secretary took to address the ethics warnings that department lawyers raised. I’d normally say that this is another example of how Donald Trump’s ethical standards have seeped into Washington DC, but let’s face it: Ben Carson has been grifting since way before he ever met Trump. It’s not that he’s learned something new from Trump. He just fits in really well.